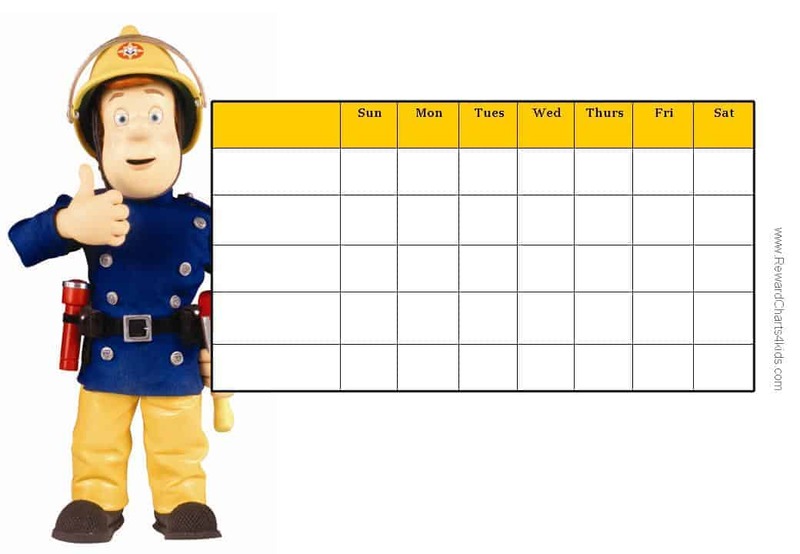 Denise asked us to prepare some Fireman Sam charts. 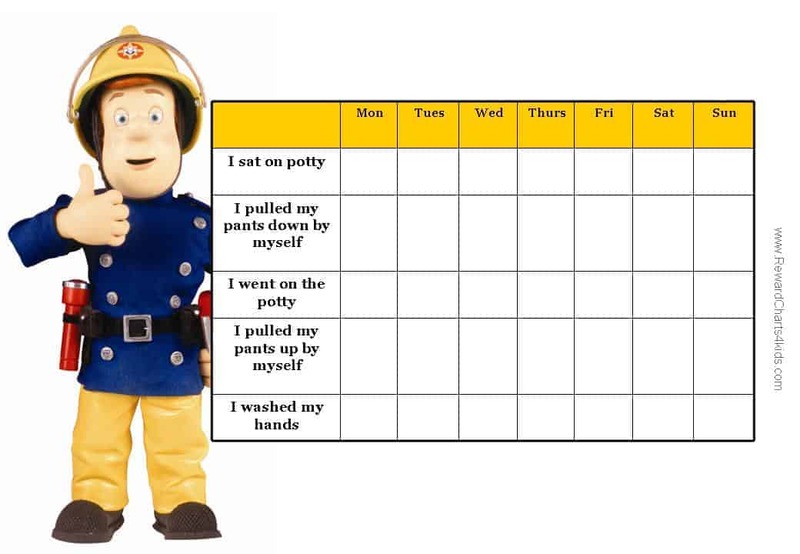 We have created a selection of free printable Fireman Sam reward charts, behavior charts, chore charts and even potty training charts. We hope that you find them useful too! If you would also like to request a specific chart then please leave a comment below! Help Fireman Sam reach the fire hydrant. 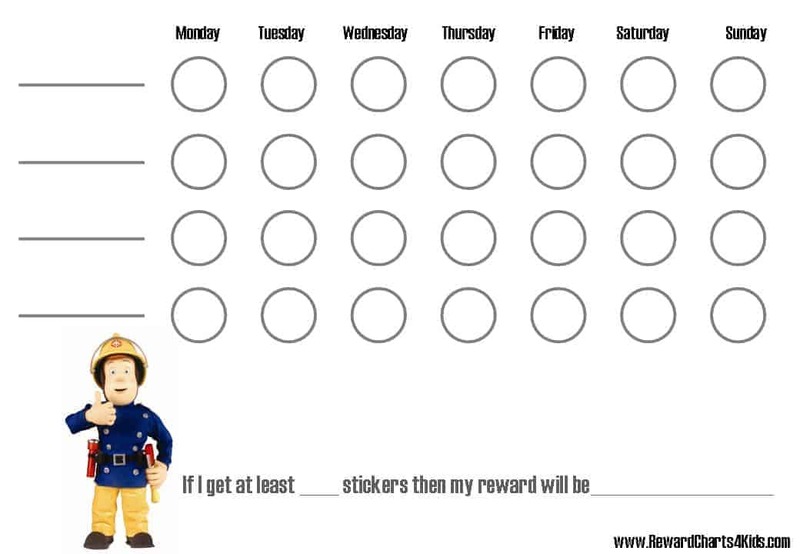 Each time you get a sticker on this reward chart Fireman Sam will get closer to the fire hydrant. He is relying on you to get there! This is a 10 step reward chart. It can be used to work on a specific issue. For example, if you are trying to get your child to stop wetting her bed then each morning that she didn’t wet her bed she gets a sticker on this chart. You can also just mark one number with a marker instead of using stickers. Once she has completed 10 steps you can give her a little prize. Some kids don’t even need a prize and completing the chart is motivating enough. 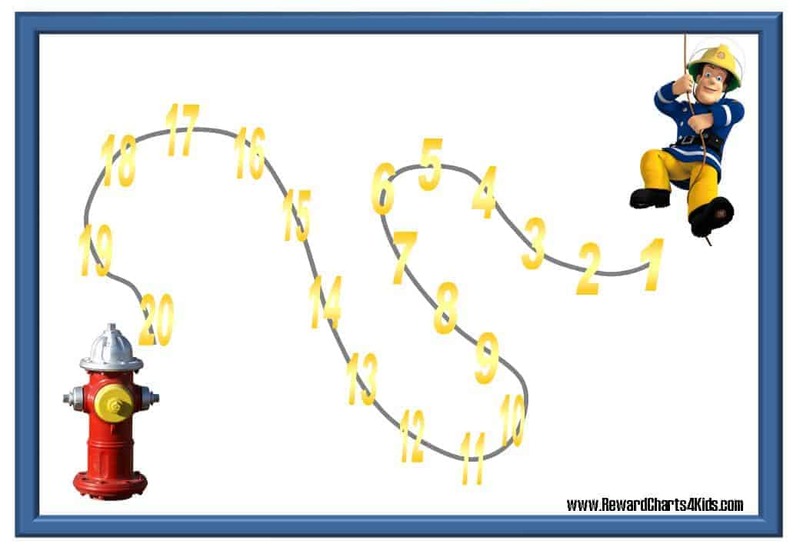 This is a 20 step chart. It can be used for older kids or issues that repeat themselves a few times a day. 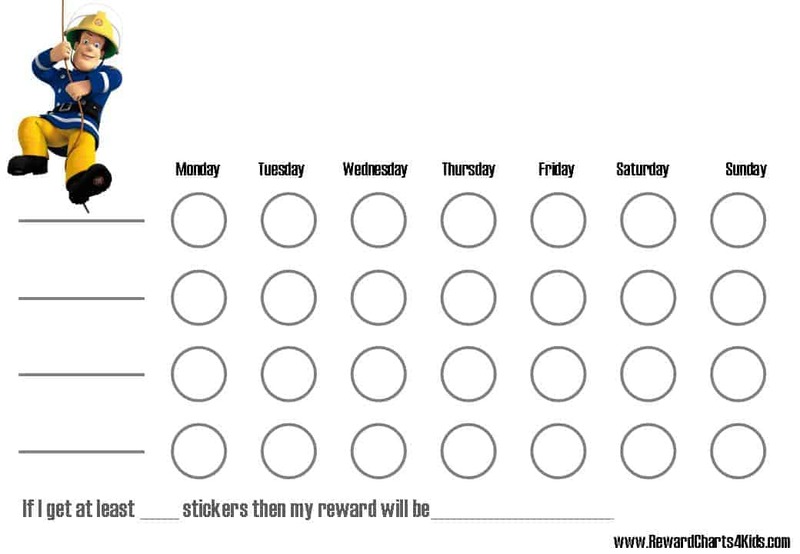 For example, if you are working on your child’s manners then each time he says “please” he can get a sticker on this reward chart. Each sticker will help Fireman Sam get closer to the fire hydrant. This is a weekly behavior chart or chore chart. The week starts on a Sunday. You can use it for various purposes. If used as a chore chart then add your chore list in the column to the left. If you are working on certain issues (such as saying please, thank-you, etc) then list the issues there too. This will make it easier to track the chart and make sure that progress is being made. This chart is similar to the one above but the week starts on a Monday. It can also be used for multiple purposes. This is a toilet training chart with Fireman Sam. There are a list of milestones required to complete the toilet training process. Mark each one as it is reached. This is a potty training chart. It is similar to the one above but it is for potty training (not toilet training). Choose the chart that suits your needs. If you would like to define different milestones then you can use one of the blank behavior charts above and add your own terminology or milestones. If the behavior chart better describes the things that you are trying to teach your child to do then you will find it easier to work with and more effective. This is a weekly behavior chart, chore chart or reward chart. Fill in the list of issues that you are working on. At the bottom of the chart there is space to record the prize that your child will receive if he/she receives a certain number of stickers. You can determine that number too.